A father gazes into his newborn’s eyes as they lay chest to chest… A new dad rocks his 2.5 month old to sleep on his shoulder… A patient father charms his picky-eater of a toddler into trying a new food. These are some of the breathtaking family moments that I’ve had the privilege of capturing through The Baby Mini Doc Project. And the fact that so many of these moments have been with dads touches a special place in my heart. You see, my own childhood memories of my father are quite fuzzy, and since starting the journey of having my own family, I’ve found myself wishing I could remember more of the details. Memories of my mom during that time are much clearer – likely because she was the primary caregiver. I remember her patience as she blow-dried my unruly hair; her face when she took me to my first day of kindergarten. Childhood memories of my dad, on the other hand, are much more elusive. He had a demanding job as an aircraft engineer, and when he was at home, I remember being jealous that my older brother got to hang out with him as he worked on his boat. And every Sunday – much to our delight – he made sure to take us all boating like it was our religion. 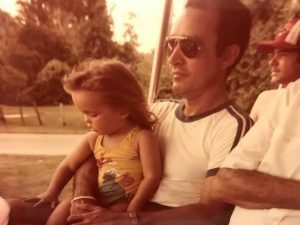 But aside from these general remembrances, the details about what my father was like when I was a little girl somehow escape me. So when I capture footage of fathers being nurturing with their little ones, I am genuinely moved. I am reminded that memories may fade, but we all come from love. And chances are, I was once that baby lying on my dad’s chest; he very likely held me as I feel asleep on his shoulder; and maybe he even fed me dinner on occasion. Capturing and preserving the essence of this love within families using the medium of documentary film is the ultimate honor for me. It is my hope that maybe – just maybe – when our children and our children’s children come of age, having these images will help them to fill in the gaps about who they are and where they come from, and perhaps even invite a bit more understanding and connection to those that surround them, and to those of us who came before. So this Father’s Day, I would like to say a heartfelt thank you to all the loving fathers out there – especially my own dad, my husband, and all of the wonderful fathers I’ve had the honor of filming with to date. Your love helps us all to be better human beings. Like what we do, but have questions before committing?